Economics is a deep and complex subject, one to which I can claim almost no knowledge whatsoever. The mechanics of how small lumps of metal and pieces of paper can hold value, alter said value constantly and bring entire species to ruin is baffling. Thanks then to Charles Stross for giving me the impetus to finally apply myself to some self-education on the matter. Inspired heavily by David Graeber’s Debt: The Last 5,000 Years, Stross’s latest sci-fi adventure is a fascinating treatise on the concept of debt slavery and how it might apply to interstellar distances which should, at first glance, render money worthless. Neptune’s Brood takes place in mankind’s distant future, at a point where galactic colonisation has become the norm and traditional human forms are a rarity termed Fragiles. Our protagonist is one Krina Alizond, one of many instantiations of her brood-mother Sondra, an extremely wealthy and powerful banker. Krina was created to be a historian of accountancy fraud – trust me, it’s more interesting than it sounds – but her life is complicated by the disappearance of a sibling. While exploring distant star systems in search of her missing sib she discovers that she is now part of the search for the Atlantis Carnet, the remnant of one of the greatest frauds ever perpetrated. Several parties are suddenly extremely interested in her whereabouts and will stop at nothing to track her down. So far, so space opera. What sets Neptune’s Brood apart from the rest is the attention paid to the economic underpinnings of the universe it creates. This future is one created entirely by debt. From instantiation one is lumbered with the debt of one’s creation, which must be paid off before becoming a truly free and independent being. Such debts are trifling in comparison with those incurred in colonising new systems though, and every newly-settled world seems to be little more than a thinly-veiled pyramid scheme built for the sole purpose of debt creation and repayment. This eternal debt cycle is fueled by monetary speed, a wonderful concept which requires some explanation. Fast money is what I used to pay for the tablet on which I’m writing this. It’s easy to use and fully liquid yet is subject to all the vagaries of the market. Saving a 1,000NT note would make no sense were I planning to spend it 1,000 years from now. Medium money takes the form of physical assets – think of today’s obsession with owning property. It’s safer, holds more value, but is less easily accessible. Now, for interstellar trade it makes little sense to use either of those currency forms. The distances and timescales involved in transmission (no warp drives here) require a new standard, slow money, whose value depends on being transmitted and verified several times during the course of a transaction. Slow money is intensely valuable, with the flip side that it is so far from liquid that attempting to exchange it at a bank results in value losses on the order of 90% or more. 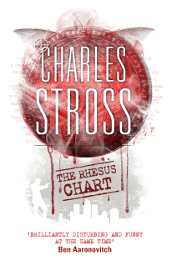 Stross takes these two ideas of ubiquitous debt and money speeds and weaves them through a highly entertaining economic whodunnit thriller in space, no mean feat. What comes out the other end can tend towards the confusing for those whose brains aren’t tuned into the world of commerce. Several times I had to re-read a passage a couple of times before its consequences even started to properly sink in. Thankfully the light show surrounding the economics lecture is entertaining enough that this wasn’t discouraging in the slightest. Rather it has sparked an urge to understand this strange universe. And let’s not forget that Charlie is a master of entertaining yet knowledgeable sci-fi so he never weighs the reader down too much. There are space pirates, communist squid, clone assassins and battles aplenty to keep things moving. The entertainment value is also elevated by some cheeky name-dropping – characters as diverse as Dan Dennett, Jeff Bezos and a certain ocean-going accountancy firm from Monty Python all have cameos. 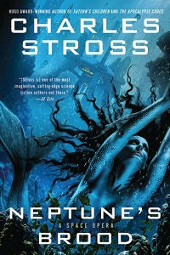 It’s a book of contradictions and contrast , that’s for sure, and perhaps that’s the ultimate beauty of Neptune’s Brood. Bodyforms are altered from humanoid to cephalopod and back at the drop of a hat, roaming interstellar churches are peopled by insane chefs and the roboticised remains of former clergy, soul chips retain backups of our mental states as well as self-constructed ‘memory palaces’. Yet none of this is remotely as confounding or unsettling as the monetary trickery involved in founding a new colony. While the heavy-going nature of the economics explanations may be off-putting for some, most should be entranced by the ease with which Stross renders the mundane bizarre and vice versa.